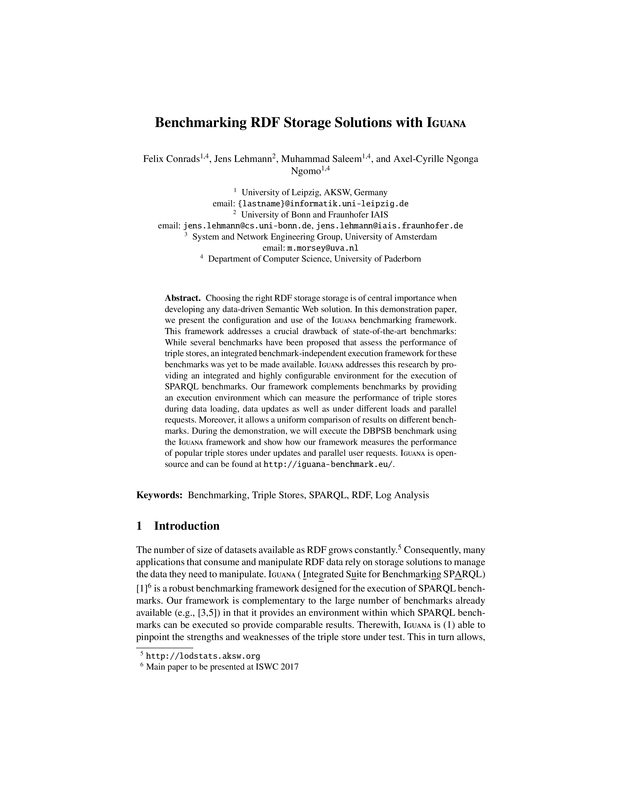 Choosing the right RDF storage storage is of central importance when developing any data-driven Semantic Web solution. In this demonstration paper, we present the configuration and use of the IGUANA benchmarking framework. This framework addresses a crucial drawback of state-of-the-art benchmarks: While several benchmarks have been proposed that assess the performance of triple stores, an integrated benchmark-independent execution framework for these benchmarks was yet to be made available. IGUANA addresses this research by providing an integrated and highly configurable environment for the execution of SPARQL benchmarks. Our framework complements benchmarks by providing an execution environment which can measure the performance of triple stores during data loading, data updates as well as under different loads and parallel requests. Moreover, it allows a uniform comparison of results on different benchmarks. During the demonstration, we will execute the DBPSB benchmark using the IGUANA framework and show how our framework measures the performance of popular triple stores under updates and parallel user requests. IGUANA is open-source and can be found at http://iguana-benchmark.eu/.